Why are these missions so controversial? 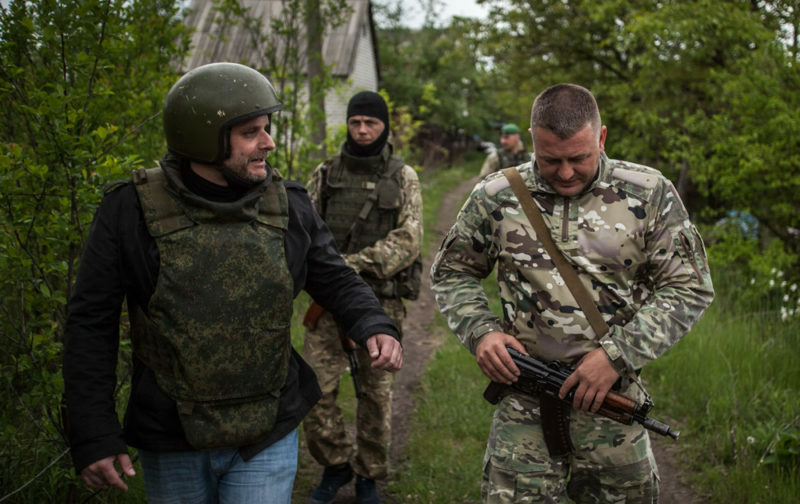 – They are not controversial – but to a group of liberal journalists they might be, and of course to the governments of Ukraine and Azerbaijan – as the Republics of Donetsk, Lugansk and Arzach are found within their former territories today. The German government doesn’t support such missions either of course. But it is not forbidden to go to these territories, neither for journalists nor for politicians, or even tourists. Arzach for example is a beautiful country with wonderful scenery, old Armenian monasteries and countless breathtaking landmarks. European tourists who are interested in culture and hiking have been going there for years. But why are especially politicians of the AfD party joining such missions? – Even that is not true. Many European politicians from different political camps visited Donbass and Arzach during the last years to get their own impression of the situation there. Arzach was even visited by former high ranking German diplomats and a Bundestag politician of Merkel’s CDU party. – Of course not! We are not a travel agency. I am just proposing candidates for such missions from time to time. That’s all. But why are the OSCE, EU or UN not conducting such missions? – For these organizations such missions are problematic. – Let me give you an example: Let us say the OCSE had observed the Crimean referendum in March 2014, and let us say the OSCE observers reported that the referendum was conducted in a correct way, respecting international standards. From that moment on, the international community wouldn’t have had any choice but to accept the reunification of Crimea with Russia as a result of a legal democratic decision by the population of Crimea. But what is the problem with that? – The so called “international community”, which is dominated by Washington, Brussels, London and Paris, is far from accepting results of democratic processes which do not fit in their geopolitical designs. They want Ukraine as a type of “anti-Russia”, as a Western front-line-entity. In the eyes of the West, the move by Crimea to leave Ukraine for archenemy Russia, was absolutely unacceptable. Today Crimea suffers under the special Western sanctions, no business with EU countries is permitted, nothing. Of course the West did everything possible to prevent the process of the Crimean reunification with Russia, but that has failed. When it became clear that neither the OSCE nor any other huge international body would be willing to observe the referendum, another international observation was organized within a short time. Many politicians from Europe came to Crimea to witness and review the procedures of the referendum. Most of these politicians came from Eurosceptic groups and parties from the right and the left. Again: Neither the Crimean nor the Russian authorities refused an OSCE observation, on the contrary – they invited them. But after OSCE refused, and an alternative international observation mission was organized. – That’s not true either. I am not member of the party. There is no connection between our German Center for Eurasian Studies and any political party. – So what? When in a local or regional sports club there are some members of a certain party – is it then affiliated with their ideology? I don’t think so. Otherwise members of political parties couldn’t join any organization without casting the suspicion of a party affiliation over the NGO. Precisely here the German mainstream media is trying to construct a connection which doesn’t exist. The press speaker of the AfD confirmed that, I confirmed that: We are politically independent. If there is no real content at all in this campaign – why did that massive media attack take place then? – What is important: The aim of this campaign is not my Center or my person. The real aim is the AfD party. In September there are going to be federal elections in Germany, the AfD will enter the Bundestag for the first time. They can expect around ten percent of the votes if we can trust the latest opinion polls. The established political parties and the mainstream media are fighting with all their means against the AfD. So we have to see this campaign in this context: There is an endgoal behind it and why it is being orchestrated now. Literally every couple of days another “scandal” is published in the mass media. “Our” scandal is just one of many. The articles about your Center say that German intel agencies are keeping an eye on your activities. – They quote “anonymous sources” and “documents” no one else has ever seen, except their particular little group of journalists. And in months of research and sleuthing they haven’t find one single German intel spokesperson to confirm that? – Why should I? And even if I do: We are not doing anything wrong or forbidden. We are not breaking any laws. Our activities are open and well documented by ourselves. The Center is working through democratic means in ways the German government doesn’t like, so I would be surprised if they hadn’t ordered intel to keep an eye on what we do. But why is mainstream media writing that? – Because it is a part of the character-assassination business. You simply say that someone is under observation by intel agencies; you render that person “toxic” for others by doing so. It’s supposed to make people believe that you are doing something wrong, something dirty, something forbidden. It sticks a stigma onto your forehead. And the story is also meant to increase Russophobia in Europe. – The key messages are: 1) Don’t deal with Russians, it is dangerous for you because you face a media campaign. 2) Everybody dealing with Russia in a cooperative and positive way is suspected of being an agent or at least of working with Russian intel. 3) All people in Europe who are objecting to the anti-Russian policies of their governments are not simply of a different political opinion, they are manipulated or paid by Russian intel. This is a totally undemocratic approach. In the end it is about the criminalization of not just people, but of opposing political opinions.